Recall that Vermeer and Rahmstorf (referred to as VR2009 for the rest of this post) propose an equation for the relationship between sea level rise rate and temperature. That the two are related seems doubtless. But Vermeer and Rahmstorf’s model describing the relationship is untenable. VR2009’s equation yields realistic looking sea level rise rates when historical 20th century temperatures are used. But that is not because the equation explains the relationship between temperature and sea level. It simply describes the relationship during the 20th century. 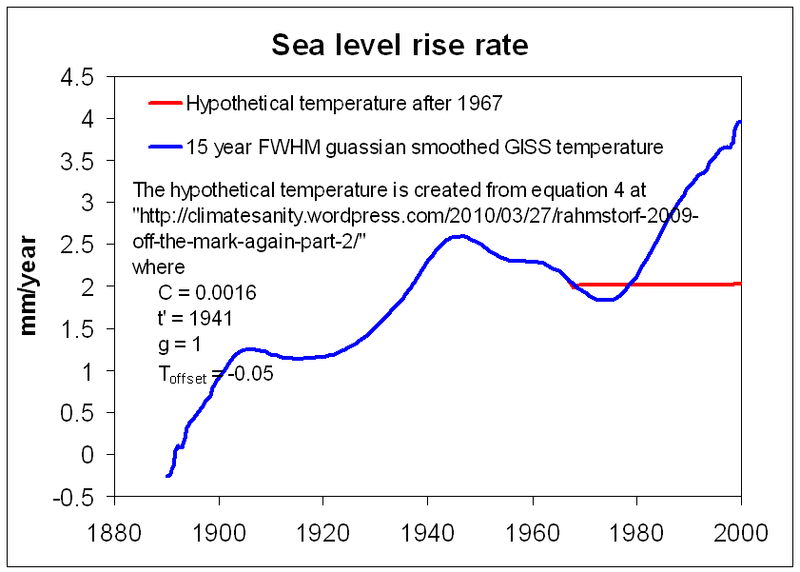 If their equation explains the relationship between temperature and sea level, then it must yield a reasonable sea level rise rate when a reasonable temperature is used. It fails this test. You can read VR2009’s PNAS paper here. Plot of resulting sea level, H, from equation 3. 1. description: Unfiltered GISS Global Annual Mean Surface Air Temperature. This serves as a baseline case. The heavy blue line in the image at the left shows the result of VR2009’s calculation of sea level rise rate (click to enlarge). Not much resemblance to my calculation. However, they reasonably used smoothed versions of the GISS temperature, so this isn’t really a fair comparison. The reason I included it is that although they have references for their smoothing technique, they do not say how much smoothing has been applied. What about the resulting sea level? 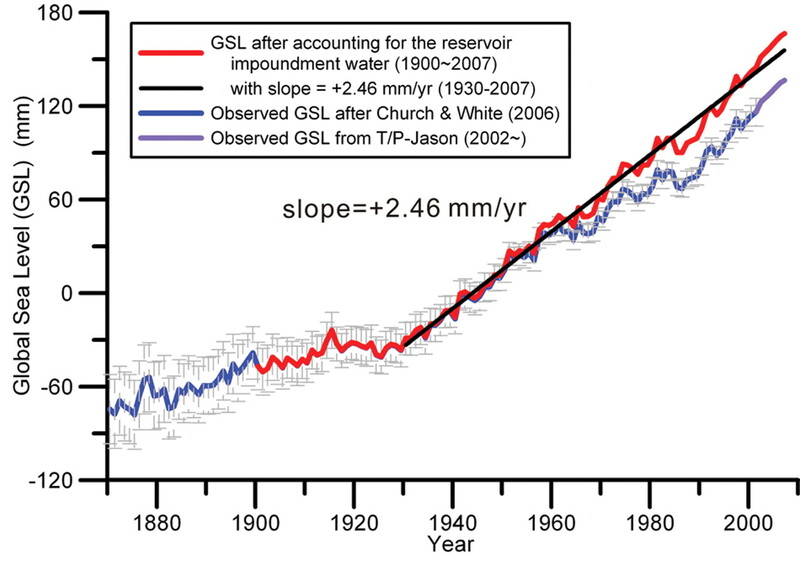 The red line in this graph shows the artificial reservoir corrected sea level data from Chao (click to enlarge). I will have a post concerning Chao’s “correction” to the sea level at a later time, but for now I will accept it for the sake of argument because it is the data that VR2009 used to calculate their values for the constants a, b, and T0. The big difference between the original Chao data and the sea level derived from VR2009’s model is the obvious bend in Chao’s data around 1930 which is missing in the sea level resulting from VR2009’s model.. Also, Chao implies that the sea level rise rate is essentially constant from 1930 to the present by fitting to a line with a slope of 2.46 mm/year. The VR2009 model has a long time period smoothing effect that results in an increasing slope that does not exist in the Chao data. 1. description. 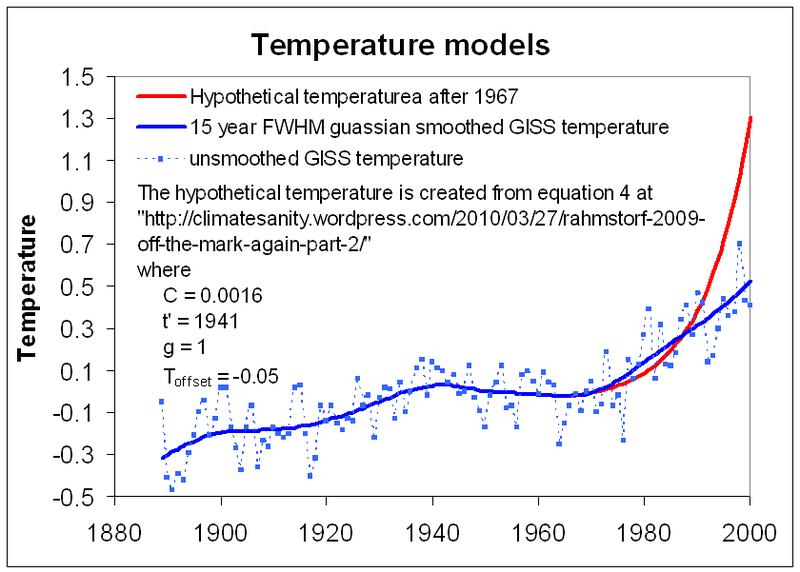 GISS Global Annual Mean Surface Air Temperature filtered with 5, 15 and 25 year FWHM gaussian filters. The sea level rise rate overlay shows that as the GISS temperature smoothing increases, the sea level rise rates for my implementation of the VR2009 model approaches the sea level rise rate graphically reported by VR2009 (see graph in comments of Test 1). 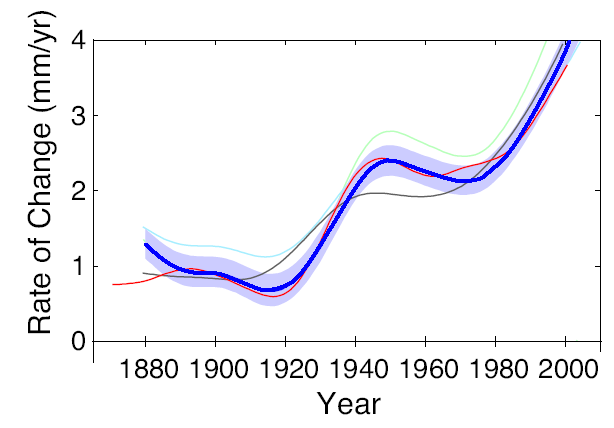 The very large sea level rise rates from 1880 to about 1887 are a result of my gaussian smoothing algorithm’s behaviour near the beginning of the GISS temperature data series. The graph on the left (click to enlarge) shows that my implementation of the VR2009 model calculated sea levels, H, for 5, 15, and 25 year temperature smooths look more or less like the corresponding smoothed versions of the Chao sea level data. However, the modeled sea levels tend to deviate upward from the Chao data at the end the 20th century. So far, so good. It is not too surprising that the PR2009 (equation 1) between sea level and temperature work fairly well to reproduce Chao’s sea level data from the GISS temperature data. After all, the variables a, b and T0 were determined by fitting Chao’s sea level data from the GISS temperature data to the proposed relationship. The following tests will involve other, hypothetical temperature scenarios that match equation 4 of my March 27th post. 1. Description. Two temperature scenarios will be compared. The first will be the same as the 15 year FWHM guassian smoothed GISS data used in test 2, above. The second will be identical to the first up to 1967, but from 1968 to 2000 it will follow equation 4 of my March 27th post, with C = 0.0016, t’ = 1941, γ = 1, and Toffset = -0.05 K. See the graph below, click to enlarge. The sea level and sea level rise rate are probably not what you would expect from the temperature. 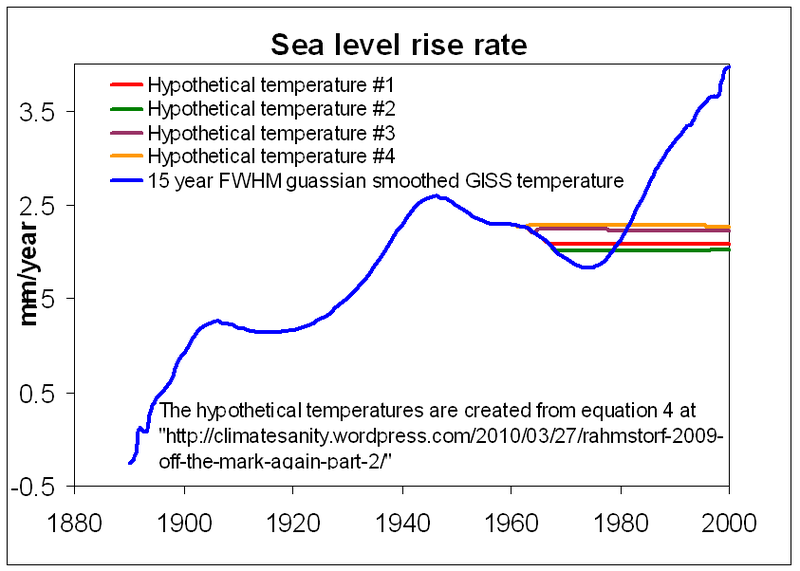 The sea level rise rate is perfectly constant when my hypothetical temperature scenario kicks in. Have I made some kind of mistake, perhaps used the wrong graph? No. I simply selected a temperature scenario that I knew would result in a constant sea level rise rate. It is as simple as making dH/dt the desired sea level rise rate constant in equation in equation 1, and using VR2009’s values of a, b and T0 , and then solving the resulting simple differential equation. The important point is that a realistic temperature scenario results in an unrealistic sea level rise rate. 1. Description. The same two temperature scenarios as test 3, with three more hypothetical temperature scenarios added. The new scenarios are defined as follows..
See the graph below, click to enlarge. No mistake here either. All four of the hypothetical temperature scenarios yield constant sea level rise rates. And, surprisingly, it doesn’t make any difference if the temperatures go up or down. Of course, I have designed these temperature scenarios to yield these incredible results not because I think these results are valid. On the contrary – the point is that VR2009’s proposed relationship between temperature and sea level rise rate yields bogus sea level rise rates. VR2009’s equation yields realistic looking sea level rise rates when historical 20th century temperatures are used. But that is not because the equation explains the relationship between temperature and sea level. It simply describes the relationship during the 20th century. 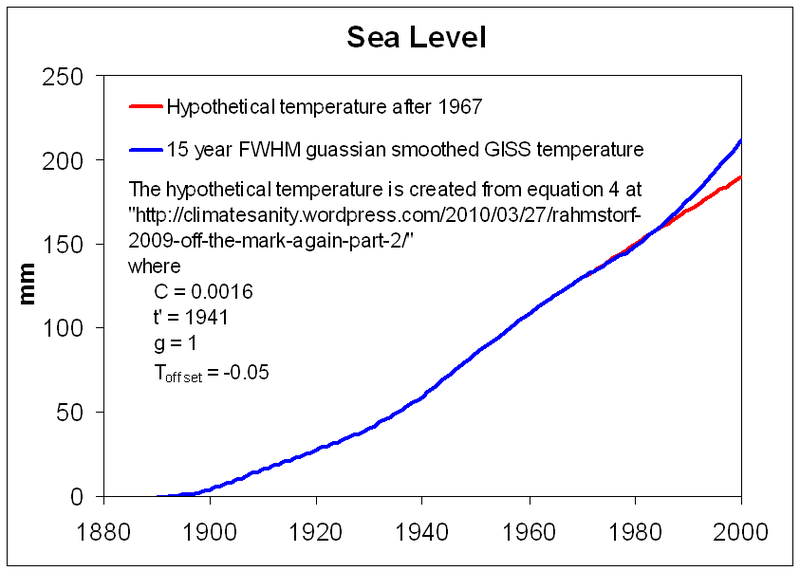 If their equation explains the relationship between temperature and sea level, then it must yield a reasonable sea level rise rate when a reasonable temperature is used. Clearly, it fails this test. Applying VR2009’s equation to 21st century temperature scenarios. Meanwhile in the real world……. You’re playing math games. Obviously you can choose an exponential function which results in a linear sea rise, and you’ve repeatedly done so. You can say that it’s not a math trick, but it is. You can also say that the scenarios you offer are realistic, but they are not, for two reasons. First, temperature does not ever increase exponentially (which is what you need to get your scenario). 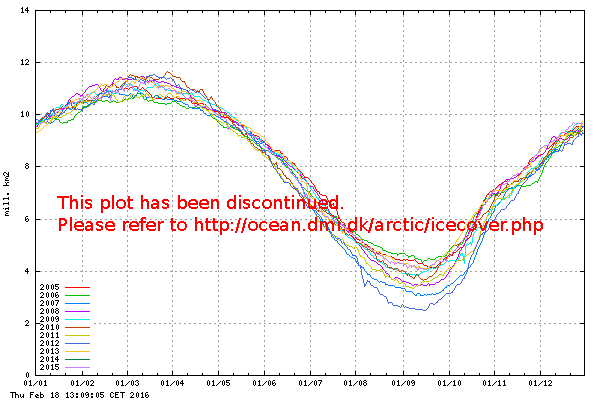 It might do so for a very, very brief period, but not extended over time. To the untrained reader, your exponential increase just looks like a rising curve, and so you are playing on their ignorance of mathematics. You are quite disingenuous in the first part of this series, when you imply that your exponential increase is closer to reality, simply because the past century saw an upswing in temperatures and an exponential curve has more of an upswing than a linear increase. The key there is that it has a continuously accelerating upswing, so the negative component can constantly match or overwhelm the positive. This is in no way similar to reality, even if the shapes of the curves to the uncritical eye look similar. Which leads to the second, major problem, which is that even if you could generate a sustained exponential increase in temperature, it would not continue endlessly. By simply terminating your graphs at 2010 you silently imply that this would happen, when in reality we’d all literally cook if such an increase ever occurred beyond the ends of the graphs (seeing temperature increases of 20 degrees within 40 years). But what happens when your exponential curves do end? dT/dt becomes zero, but T – T0 is higher, and sea levels then rise. As to your comment that the equation describes rather than explains the rise, well yes, of course, that’s obvious. Vermeer and Rahmstorf never said otherwise. It’s just science. How many papers a year demonstrate unexpected correlations without yet being able to explain them? Galileo and Newton didn’t explain gravity, they described it. Is their work therefore without merit? I do not know if you read all three posts, but I was clear, direct and open about using the exponential increase to generate my temperature scenarios to illustrate my point. I even worked out the equation here. I could have saved myself a lot of time by simply generating the temperature scenarios, without giving any details about how I generated them, and applied Vermeer and Rahmstorf’s model to them. The result would have been identical – realistic temperature scenarios yielding bizarre results. But there is nothing special about my temperature scenarios – they are neither extreme in magnitude or shape compared to what nature has generated (according to GISS) in the last century or is likely to generate (according to the IPCC) in this century. You are correct; “Ignorance of mathematics” is a problem. And I do not use the word “ignorance” here as a pejorative. My assumption is that my (small) audience is a typical cross section of the general population, most of who are not versed in calculus or differential equations (not that I have any particular genius in mathematics). So I struggled with my presentation. You may have noticed that I apologized for the tedium of the math at one or two points. Adding the links to the spreadsheets was an after-thought – it allows someone to examine actual numbers. 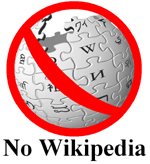 It is a format that is more accessible to more people. You are correct that this is “the key” to my hypothetical temperature scenarios (so far). But there is nothing disingenuous about it. I think I made it perfectly clear that that was my approach. I chose that approach not because it is the only one, but because it is the simplest one – simply set dH/dt to a constant in Vermeer and Rahmstorf’s model equation and then solve the remaining differential equation. But I could have set dH/dt to any time evolving function and then solved the differential equation – but for most cases that would make finding the solution more difficult (at least for me). The temperature scenarios that I generated could happen this century (or could have happened last century). There is nothing extreme in their shape or magnitude. 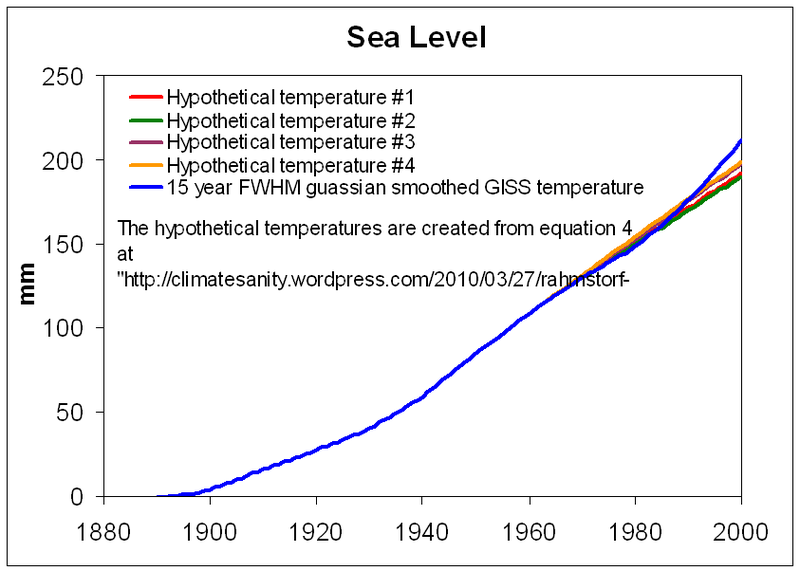 And if those temperature scenarios did happen, then according to Vermeer and Rahmstorf’s equation, the resulting sea level rise rates would be the bizarre cases that I have shown. I did not “silently imply” that my temperature scenarios would “continue endlessly.” I have no reason to imply such an unrealistic thing. 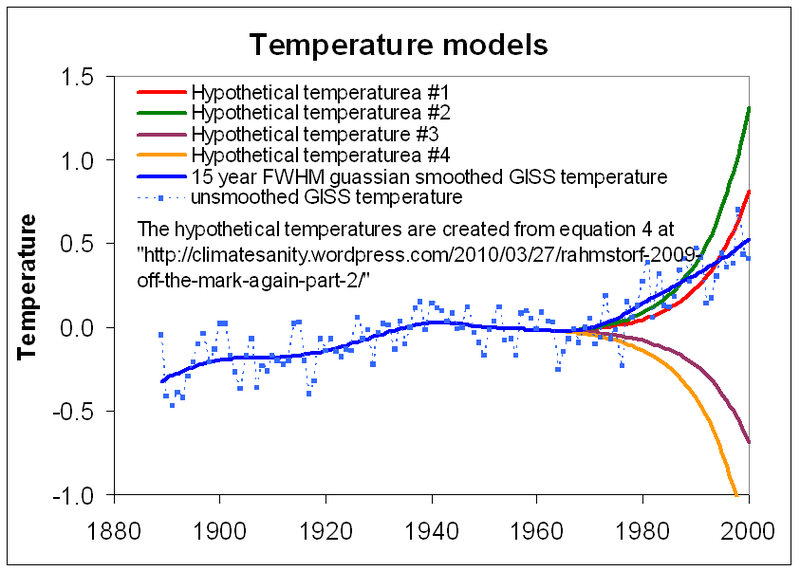 But since you brought up the point, let’s consider what would happen, according to Vermeer and Rahmstorf’s model, if the temperature followed one of these trajectories with an increase “of 20 degrees within 40 years.” The improbable result would be, according to their model, that the sea level rise rate would stay constant during that time. This is correct. However, they will rise in the most improbable way. This point will be discussed in a future post. Please stay tuned. In fact they imply otherwise when they claim that their equation can be used to predict future sea level rise rates. I realize that I belaboured the difference between explanation and description. But it is an important distinction. Their equation is the linear combination of two functions of the temperature, T (a linear term and the time derivative of T). Adding another function of T (pick something randomly, perhaps the square of the time derivative, or the square root to T) would yield as good or a better fit between temperature and sea level than the equation proposed by Vermeer and Rahmstorf if the proper coefficients were chosen. Would that mean that this new equation is a better model, with each term having some physical meaning? Newton’s laws of motion under gravitational force apply equally well to the motion of Saturn’s moons as they do to the moon’s of Jupiter, which were originally observed by Galileo. They do not imply that Saturn’s moon’s have square orbits while Jupiter’s are elliptical. In other words, they do not yield bizarre results when applied to new, but similar, circumstances. Unfortunately, Vermeer and Rahmstorf’s equation does yield bizarre results when applied to new, but similar, circumstances. Thank you again for you thoughtful comments. I hope you will continue to read my coming posts on this topic and add your thoughts. You have to understand this point: all data has to make sense and be internally consistent. Matching the past does not mean that you can predict the future. Why would an exponentially dropping temperature give a constant sea level rise.? It can’t, physically. While these are the most extreme visual problems, this means that the other data produced is invalid as well. In short, the problem isn’t that the author is breaking the formula, the problem is that the formula itself is broken. The problem is basically that they included a differential in a state function. dH/dt has no business being related to dT/dt. It is obviously a function of T and of many more complicated items like geology and wind patterns. They compensated in the historical data by matching up the constants.However, the forgot to do elementary quality control. Until they can incorporate the slope of the container walls into any equation of sea level rise none of this is valid. Adding the same amount of water into a cylindrical drinking glass and a ceral bowl with sloped sides causes two different water level increases. What do you mean the future can’t be predicted??? So as you can clearly see, we already know what’s going to happen all the way to up 2100.